As the season hits its final weekend, much is left to be decided in the 2010-11 playoff field. Friday's busy slate has several games that will determine who is or isn't playing next week and where they will be. What's at stake: Detroit already has clinched the Central Division title, but the Wings could leapfrog the Sharks for second in the West, which would guarantee them home-ice advantage through at least the first two rounds of the playoffs. The Hawks won't necessarily clinch a berth with a win, but they will with at least one point if Dallas loses to Colorado on Friday. If the Stars manage a win, a victory for the Hawks would leave them needing just one point on the final day of the season to secure a spot. How's it going: Jonathan Toews' overtime goal gave Chicago an important win against St. Louis on Wednesday, but the Hawks still have not won in regulation since March 23. The Wings lost 3-0 to Carolina on Wednesday, but had won their two previous games. Upcoming: The Blackhawks and Red Wings will end their seasons Sunday in Chicago (12:30 p.m. ET, NBC, TSN) when they finish off their current home-and-home set. Some teams know when to get their act together, and coach Paul Maurice seems to have gotten the Canes to do just that. After falling from the East's top eight with a rough stretch in mid-March, Carolina has come roaring back. The Hurricanes are 7-1-1 in their past nine and will find themselves in the postseason if they win their final two games. The Coyotes have gotten points in their last two games, but two straight shootout losses have made things more anxious than need be. Phoenix still is not guaranteed a postseason place, and they haven't won in regulation since March 24. Where they stand: The Penguins are fourth in the Eastern Conference; the Islanders are 14th in the East. What's at stake: The Penguins have pulled to within one point of the Atlantic-leading Flyers, and they could pass them with a win Friday, putting Pittsburgh in the driver's seat for a division title and the East's No. 2 overall seed. The Islanders' impressive second half indicates plenty of promise for next season and beyond. How's it going: After suffering its first back-to-back losses in 10 games, Pittsburgh rebounded to win consecutive games, against Florida and New Jersey. New York lost 3-2 in Boston on Wednesday night, their fifth loss in the past six games. Upcoming: The Penguins will end the regular season Sunday in Atlanta. New York could help determine if the Pens take the Atlantic Division crown when it finishes its season Saturday in Philadelphia. Where they stand: The Flyers are second in the East; the Sabres are seventh in the East. What's at stake: Philadelphia still has a shot at snagging the No. 1 seed in the East, but the bigger concern is fending off the Penguins, who are just one point behind them in the Atlantic Division. Buffalo would clinch a playoff berth with a win. How's it going: The Flyers are slumping at the wrong time, going 0-3-1 in their past four games, including a 5-2 loss in Ottawa on Tuesday. Buffalo beat Tampa Bay 4-2 on Tuesday and is 7-1-2 in its past 10 games. Upcoming: Depending on what happens Friday, Philadelphia either will try to polish off a division title Saturday against the Islanders in the season finale or look to overtake Pittsburgh before waiting to see what happens Sunday. Buffalo finishes the season Saturday in Columbus. Where they stand: The Hurricanes are ninth in the East; the Thrashers are 11th in the East. What's at stake: Carolina owes a significant debt of gratitude to Atlanta, which gave the Hurricanes an opportunity to control their own destiny by beating the Rangers on Thursday. Now with a regulation or overtime win, Carolina would overtake the Rangers for eighth place by virtue of having one more non-shootout win this season. How's it going: The Hurricanes are coming off Wednesday's big 3-0 win against Detroit and are 7-1-1 in their past nine games. Atlanta dealt the Rangers a big blow with its 3-0 win in New York on Thursday, but the Thrashers have won just two of their past five games. Upcoming: Carolina will try to seal a playoff berth in its final game of the season, Saturday against Tampa Bay (7 p.m. ET, NHLN-US). Atlanta will end its season Sunday against Pittsburgh. Where they stand: The Panthers are 15th in the East; the Lightning are fifth in the East. What's at stake: The Lightning still have a shot at overtaking Pittsburgh for fourth in the East, which would give the Bolts home-ice advantage in a first-round playoff matchup between the two. How's it going: The Panthers' 5-2 loss to the Capitals Wednesday dropped Florida to 0-6-3 in its past nine games. The Lightning are starting to get hot at just the right time. Tampa Bay may have lost to Buffalo on Tuesday, the finale of a three-game road trip, but prior to that they had won five in a row. Upcoming: Florida ends the season Saturday when it hosts Washington. Tampa Bay finishes the regular season in Carolina on Saturday (7 p.m. 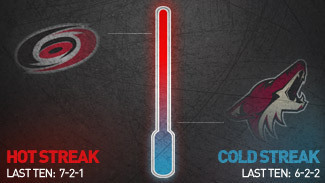 ET, NHLN-US) in what could be a massive game for the rival Hurricanes. Where they stand: The Blue Jackets are 13th in the West; the Predators are fifth in the West. What's at stake: Nashville can clinch a berth with one point or any kind of Dallas loss. A win also could lift the Predators into fourth place, which would give them home-ice advantage for at least one round of the playoffs. How's it going: The Blue Jackets' 3-0 loss to Dallas on Tuesday dropped them to 1-5-3 in their past nine. The Predators beat Atlanta 6-3 on Tuesday, making them 10-2-1 in their past 13 games. Upcoming: Columbus ends its season by hosting the Sabres on Saturday. Nashville finishes the regular season Saturday in St. Louis. Where they stand: The Stars are ninth in the West; the Avalanche are 14th in the West. What's at stake: Dallas can continue to make life anxious for fans in Chicago, Anaheim, Phoenix and Nashville. A win would keep them alive in the postseason race and would lift them into eighth place in the conference if the Blackhawks lose to Detroit in regulation. The teams would be even in points and regulation/overtime wins, but Dallas would hold the third tiebreaker, head-to-head points; the Stars went 3-1-0 against the Hawks this season. Anything other than two points for the Stars, however, would be detrimental to Dallas' postseason hopes if Chicago and Anaheim manage to get at least one point in their respective games. How's it going: Dallas defeated the Avs in the first half of a home-and-home Thursday, giving the Stars their third victory in a row. The loss was Colorado's seventh in its last eight games. Upcoming: The Stars could determine their playoff fate when they play the final game of the NHL's 2010-11 regular season Sunday in Minnesota (5 p.m. ET, NHLN-US, NHLN-CA). The Avs end their season Sunday at home against Edmonton. Where they stand: The Sharks are second in the West; the Coyotes are sixth in the West. What's at stake: A win for San Jose would keep the Sharks ahead of Detroit in the race for the second seed in the West. The Coyotes would clinch their second consecutive playoff berth with one point and could jump Nashville and Los Angeles for fourth place with a win. How's it going: The Sharks fell to Anaheim 6-2 on Wednesday, but San Jose still has won eight of its past 10. The loss to the Ducks was the Sharks' first in regulation since March 14. Phoenix has lost each of its last two games in a shootout, but the Coyotes are 9-2-3 in their past 14 games. Upcoming: San Jose and Phoenix end their seasons with the second half of their current home-and-home Saturday in San Jose. Where they stand: The Kings are fourth in the West; the Ducks are seventh in the West. What's at stake: As the Kings and Ducks open a home-and-home for the last two games of the regular season, L.A. has a valuable opportunity to knock its geographic foe out of the race with a sweep, depending on what happens elsewhere. The Kings also could solidify home-ice advantage in the opening round with a victory, combined with losses by the Predator and Coyotes. The Ducks, meanwhile, would clinch a playoff spot with a win, or with one point if the Stars fail to get two points against Colorado. Depending on how things shake out throughout the conference, there also is a chance for an all-Southern California opening-round series between the teams. How's it going: The Kings defeated the Coyotes in a shootout Wednesday, but they've been inconsistent of late, going just 2-2-0 in their past four games. The Ducks beat the Pacific-champion Sharks 6-2 on Wednesday courtesy of a hat trick by Corey Perry, which saw him hit 50 goals for the season. The win also ended a two-game losing streak. Upcoming: These two teams will wrap their season against each other in Los Angeles on Saturday.